A little while ago, I got this beautiful book as a present. It's a book which is written in English and Dutch and it's an absolute must for all those 'felting freaks'. It has wonderful photography, decribes the process of felting and gives some great felting artists a chance to show their work. 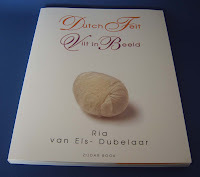 It is written by Ria van Els-Dubbelaar. She is a passionate creator of textile art and feels equally enthusiastic about passing on her art and skills to others.